Most public restrooms are not kid-friendly. Lavatory sinks are not designed with the height of a child in mind. But it is very important for children to be able to wash their hands since that is one of the best ways to prevent the spread of germs and viruses. However, the adult height of most lavatories makes hand washing for children a difficult task. Most parents know the struggle of lifting a 30 to 40 pound child up to the sink. After a long day of shopping or traveling, carrying bags, loading and unloading strollers, etc., this can be quite exhausting. In addition, it almost always results in an inadequate cleaning, along with water soaking the child’s clothes and the floor. Parents tend to patronize businesses that cater to their needs and help reduce their stress. If your building includes amenities that can help create a better customer experience, that makes your business a much more attractive place to go. The Step-N-Wash is designed to do just that. 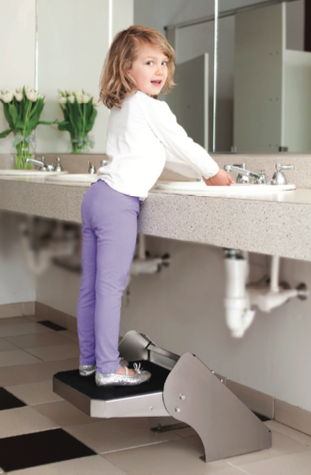 This self-retracting step allows children to stand at the sink and wash their hands without any assistance. No more lifting and straining for mom and dad. The parent or child can use their foot to pull the step down, and then the child can step up to the sink. When the child is finished and steps down, the step retracts back under the sink and out of the way. 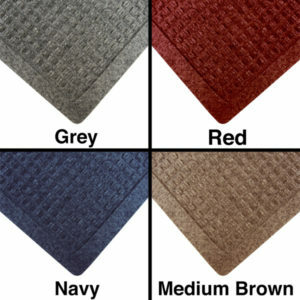 The Step-N-Wash is a very sturdy, stable, and safe addition to your public restrooms. It is constructed of type 304 stainless steel, and contains no pinch points. A marine grade non-slip rubber tread provides good traction. The whole unit is bolted into the floor, and can hold a static load of up to 800 lbs. No part of an adult’s body will ever come in contact with the Step-N-Wash while it is retracted. 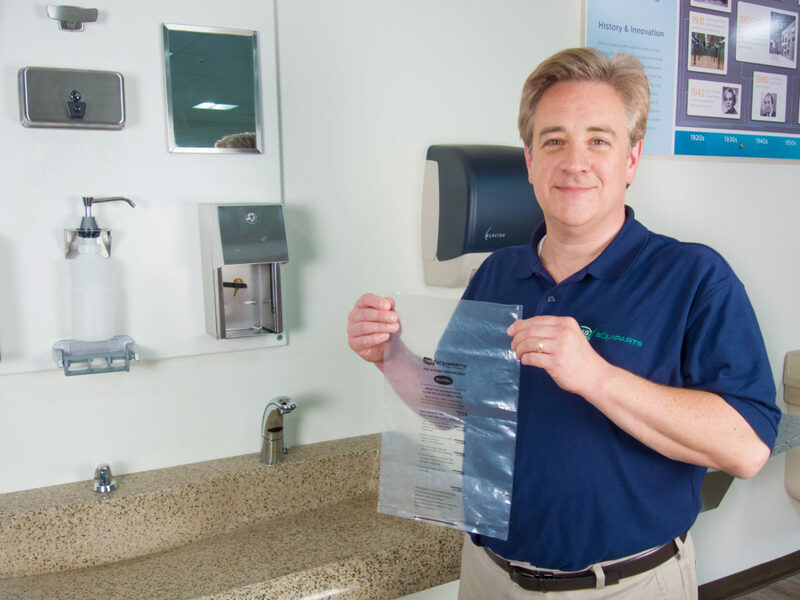 When it is installed in a restroom with two or more lavatories, it is in full ADA compliance. The Step-N-Wash is also very cost effective. If the Step-N-Wash is used just 15 times a day, that works out to less than two cents per use over a five year period. The Step-N-Wash is used significantly more often than a diaper changing table. 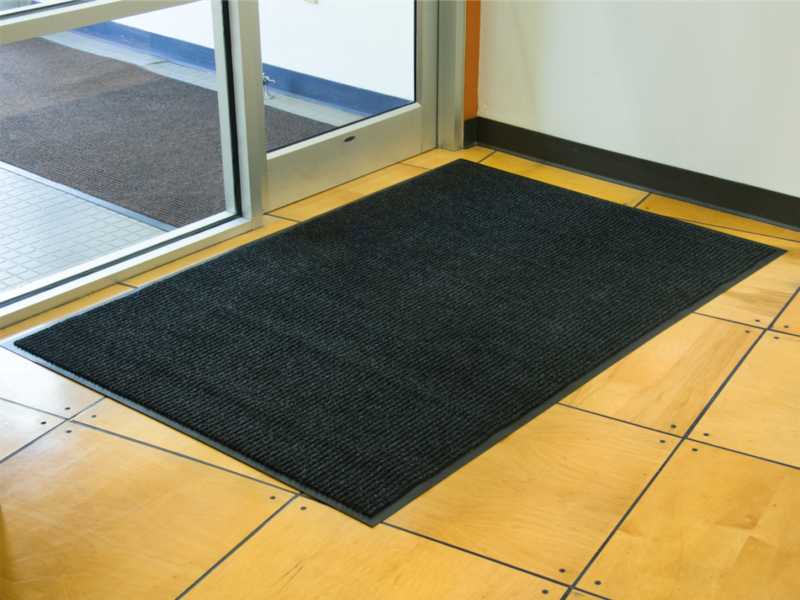 It will also help keep your restrooms dry, thereby reducing your liability for slips and falls. There are many businesses where the Step-N-Wash is already in use all around the country; places such as shopping malls, airports, restaurants, amusement parks, museums, aquariums, churches, and schools. Create a better customer experience by making your business a more stress-free place for parents. They’ll thank you by becoming returning customers. View, share, or save the Step-N-Wash PDF. 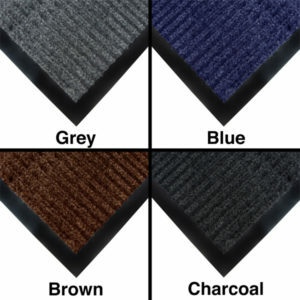 View installation instructions and more product info in the Step-N-Wash Part #16760 Product Listing in our online store. Call us at 800-442-6622 M-F 7:30AM to 5:00PM (EST) and speak with an Equiparts Product Expert today for more information. 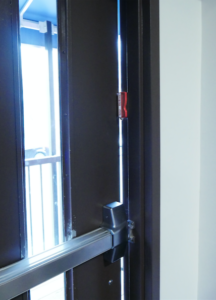 Fix your loose door hinges without drilling new holes! Hinge Repair Screws are the most efficient option when making hinge repairs caused by stripped screws. These specially made screws have a #12 Phillips undercut head with a #14 oversized body that is both self-drilling and self-tapping. 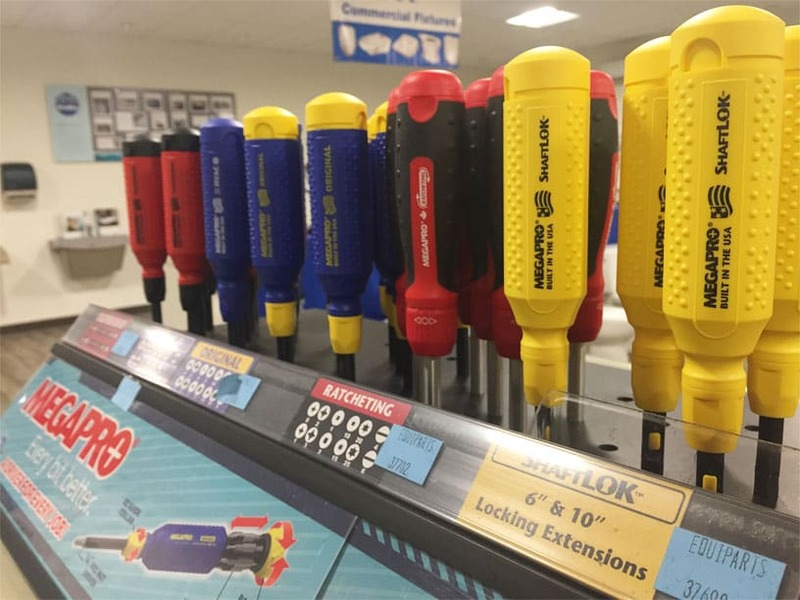 These specialized screws enable you to simply replace a stripped screw used in a door hinge, rather than having to resort to the multi-step, time-intensive ‘toothpick and glue method’, which involves plugging the holes with wooden dowels, redrilling the hole, then replacing with the same size screws. The reason why these screws are specialized for this specific task is their oversized screw body and regular sized screw head. The oversized screw body enables the screw to fit tightly into the old drill hole. The regular sized screw head enables the screw to lay flush in the hinge instead of sticking out, which would prevent the door from closing all the way. The screws listed below are divided into two sections based on screw type. The first section includes different quantities and finishes of hinge repair screws that are designed for metal applications. This screw has an undercut head. They are self-tapping and have a fine thread, which is best when drilling into metal doors and doorways. These metal application hinge screws are available in chrome plated or black plated finishes, and in quantities of 12, 24, or 100. The second section below includes hinge repair screws designed for wooden applications. They have an undercut #12 screw head and sheet metal screw thread. This screw is best to use when screwing a hinge into a wooden door and doorway. These wood application hinge screws are available in chrome, brass, and black plated finishes, and in quantities of 12, 24, or 100. 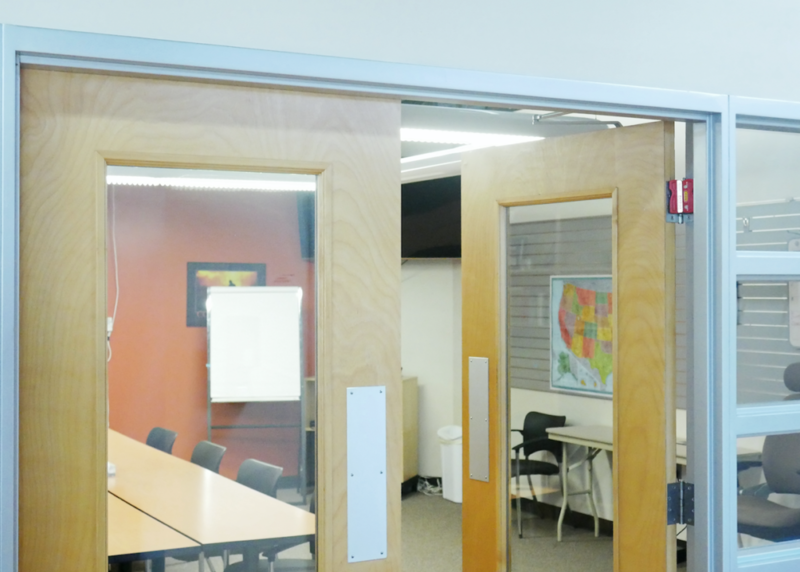 View our Hinge Repair webpage to see the hinges we have on sale now. 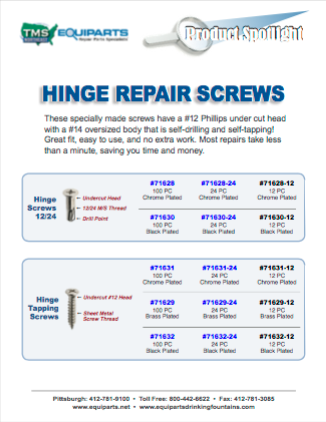 Submit a quote through our website for the hinge repair screws you need, and a sales rep will get back to you shortly. You can also just give us a call to speak with a rep directly and place your order. 800-442-6622 M-F 7:30AM to 5:00PM (EST). View, save, or share the Hinge Repair Screws PDF, which lists all quantities of Hinge Repair Screws available for the two hinge screw types. Click on the blue part numbers on the PDF to get to the specific screw listing on our website. 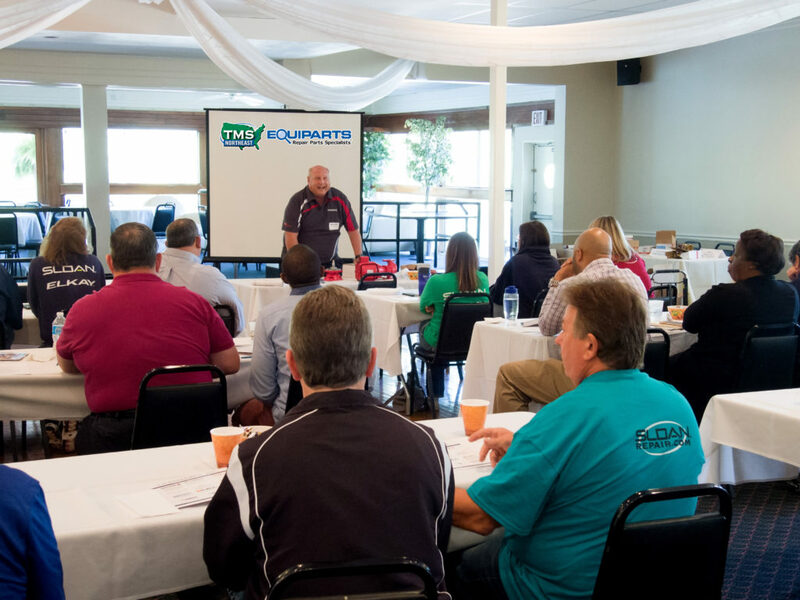 Equiparts recently held our Fall 2017 Sales Meeting in Oakmont, Pennsylvania. 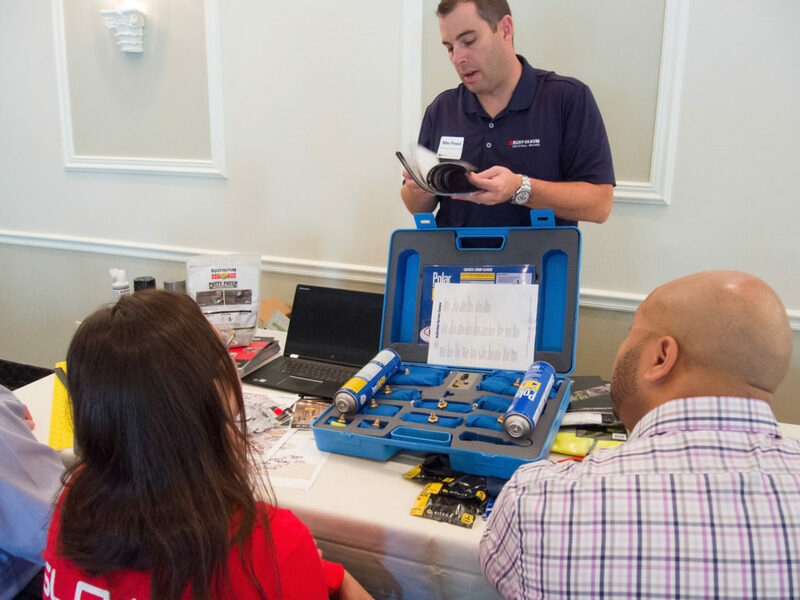 It was a very productive two-day event that included vendor presentations, new product demonstrations, technology updates, and a review of the state of Equiparts as a company. The meeting was held at Riverside Landing, a beautiful venue in Oakmont, located on the Allegheny River, just north of Pittsburgh. 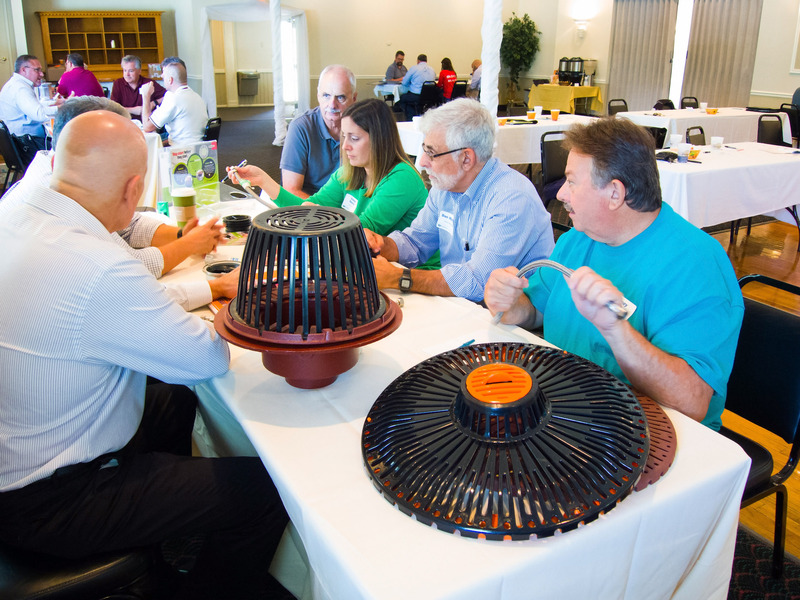 It was attended by our inside and outside sales reps, managers, and purchasing employees. At Equiparts, we pride ourselves on our technical knowledge and product support. In order to continue as an industry leader in this area, we make educating our sales force a top priority. The more that our team understands the products we sell, the better we can serve our customers. That’s why we invite a variety of vendors to every Sales Meeting. We are extremely grateful for their participation. 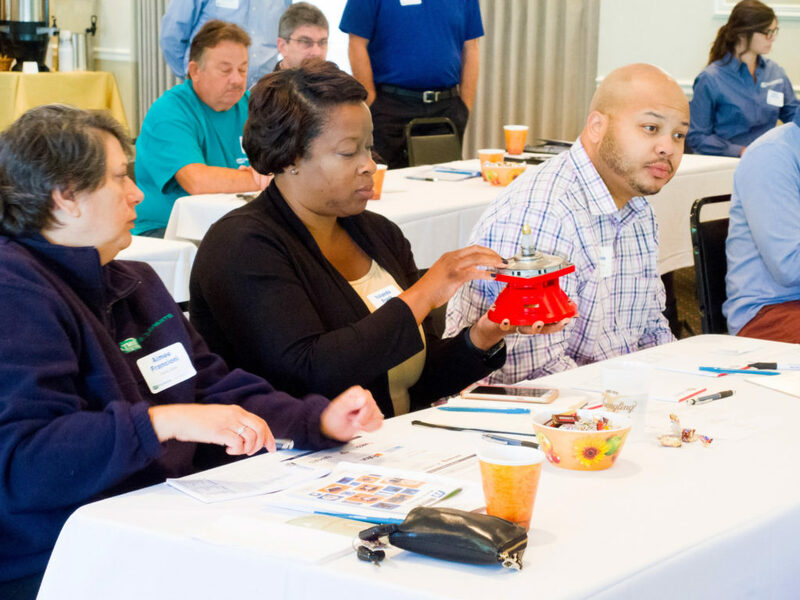 They educate our employees about new and existing products, explain the features, benefits, and applications for each item, and outline the industry requirements for installation and use. These presentations keep our sales team up-to-date on important information that we are able to pass along to our customers. By keeping our customers informed, they are able to make better purchasing decisions for their particular situation. Metcraft Industries, Inc. is an industry leader in anti-ligature fixtures. 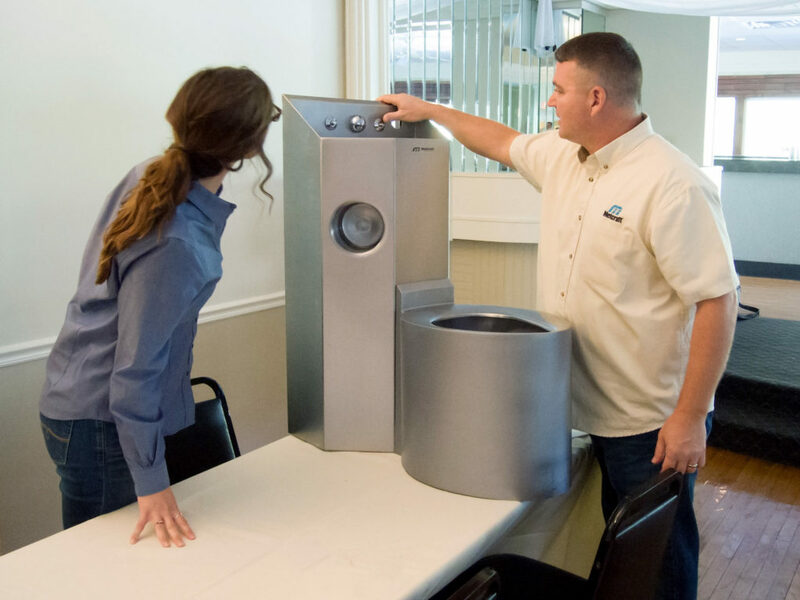 Stacey introduced some exciting new products from Metcraft, like the stainless steel sink and toilet combination unit (pictured below,) and an anti-ligature deck metering faucet he brought to the meeting. 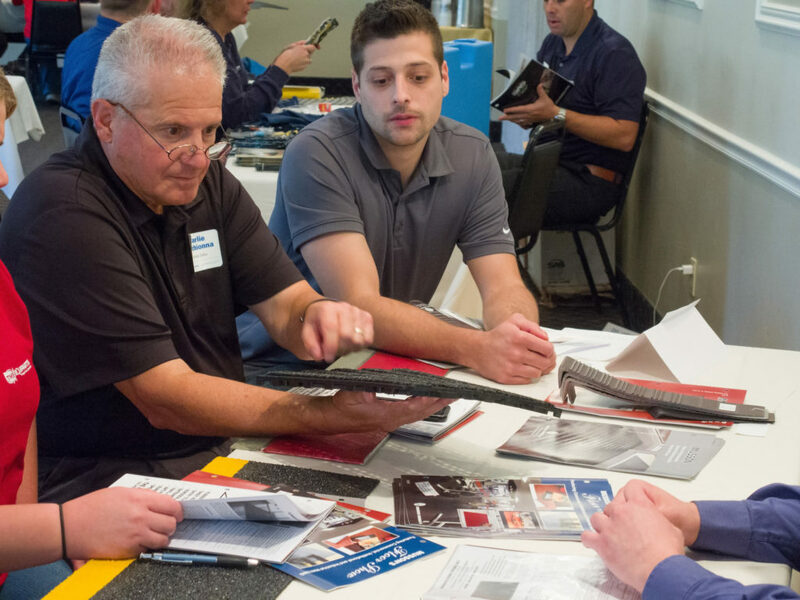 He also discussed proper maintenance practices for stainless steel fixtures, updates to obsolete products, new industry codes, what sets Metcraft apart from its competitors, and more. View our online selection of Metcraft fixtures and repair parts. If you are interested in a Metcraft fixture or repair part that is not listed on our site, give us a call and we will order the Metcraft part you need. Here’s Stacey explaining how the faucet in the the new multi-use stainless steel Metcraft unit is designed to be anti-ligature. Armstrong Fluid Technology is a leader in HVAC systems including a wide range of pumps and related equipment. Steve’s presentation included a lot of great information about Armstrong pumps. He discussed the most popular part that fails in a bearing or motor (the coupler), what it means when you hear a coupler rattling, when to replace motor mounts, when to perform preventative pump maintenance, the problems created by air bubbles in pumps, and other useful insights on pump maintenance and troubleshooting. Here’s Yolanda, purchasing manager at Equiparts, inspecting an Armstrong bearing assembly, one of the many Armstrong parts we carry at Equiparts. Below are photos taken of the various manufacturers who participated in our round robin presentations. Here is Mike discussing a new Wheeler Rex product now available from Equiparts that freezes water lines, enabling customers to form single or double ice plugs to perform maintenance on water pipes. Here is Mike discussing a new Wheeler Rex product that freezes water lines. It enables customers to form single or double ice plugs so that they won’t need to drain the system to make repairs. It’s now available at Equiparts! Chad showcasing the new National Sign sign line now available through Equiparts. Russell discussing the application of John Guest push fitting elbows. 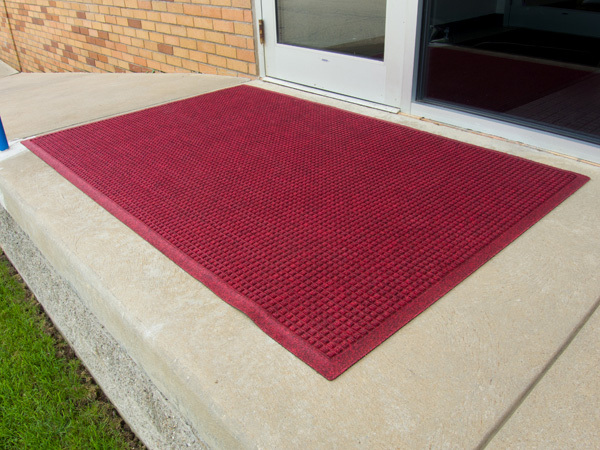 Charlie, outside sales rep at Equiparts, asks Trent about the material of the raised entrance mats he’s holding. 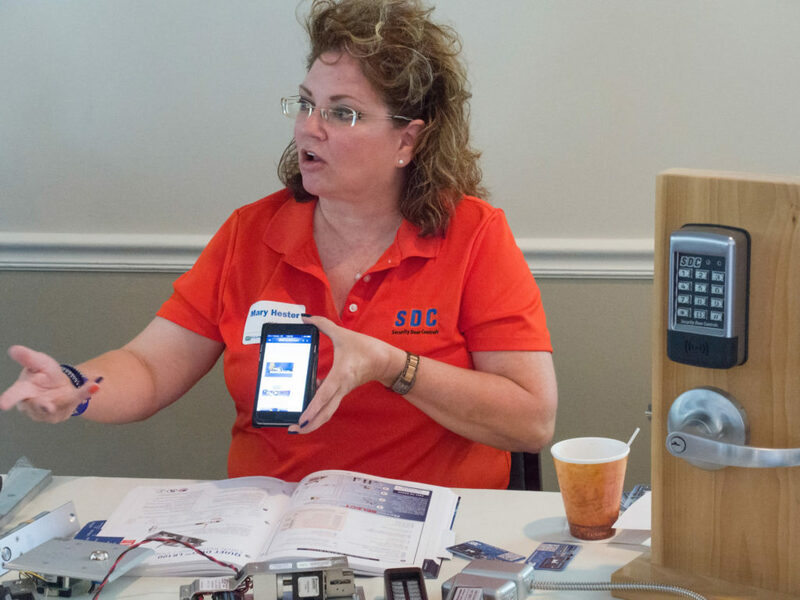 Mary shares the SDC app that enables us to share images of doors with her to help our customers figure out their security options. Here’s the Rector Seal, Mifab, and Brasscraft table, where the features and applications of roof vents, floor drains, and leaf catchers were discussed. Here is Kevin showing the expansion hose/flange of a Flex Hose. 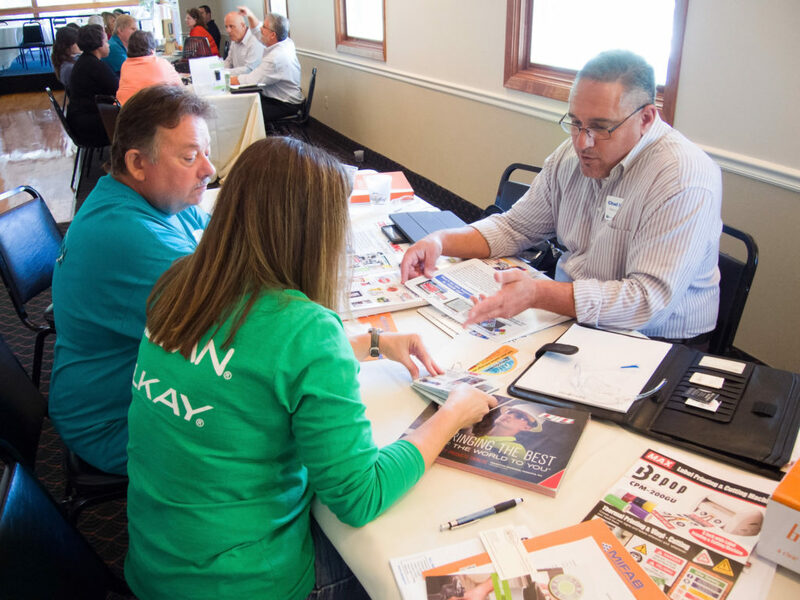 Our 2017 Fall Sales Meeting was a great success! PDF Viewer not working? Click here to view or read the article excerpt from the Sloan Maintenance Schedule Booklet below. 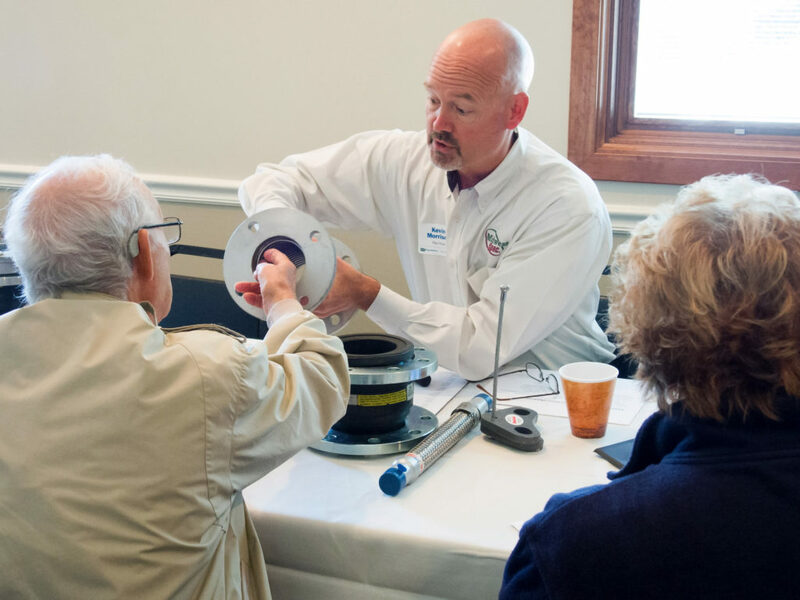 How Does a Sloan Royal Flushometer Work? Flushometers are strange looking pieces of engineering. Few people know how these essential fixtures of a restroom work, or what lies within their chrome plated exteriors. There are two types of flushometers: piston type and diaphragm type. In this article, we will take you inside a Diaphragm Type Sloan Manual Flushometer to show you its various parts, and explain what those parts do. The heart of the flushometer is called the Diaphragm Assembly. It’s the “engine” that drives the whole unit. It’s also known as a retro kit, inside parts kit, or a drop-in kit. (We don’t recommend you actually drop the kit into your valve, because it could result in damage. Just lower the kit carefully onto the valve seat.) The diaphragm assembly regulates the pressure inside the valve. It is the change in pressure that causes the valve to flush when the handle is pulled. The assembly also controls the volume of the flush. Water sits inside two chambers in the valve body – the upper and lower chambers. When a flushometer is idle, the pressure in the upper chamber is greater than the pressure in the lower chamber due to its greater surface area. This keeps the diaphragm pushed down against the valve seat, and prevents any water from flowing down into the valve. When the handle is pulled, a plunger inside the handle assembly pushes against the bottom part of the relief valve stem. This causes the relief valve to push the diaphragm up and release the pressure. As a result, the water in the chambers flows down into the valve and then into the toilet or urinal. The volume of water that is released is determined by the type of diaphragm assembly in the valve. Once the flush is initiated and water flows out of the valve, water from the supply line begins to fill the valve chambers again. A small bypass hole in the diaphragm allows that water to flow into the upper chamber. As the water pressure in the upper chamber begins to build, it gradually pushes the diaphragm back down onto the valve seat. Once the diaphragm lowers back onto the valve seat and the upper chamber is sealed, the flow of water from the inlet stops. The valve is now ready for the next flush. If your flushometer won’t shut off and continues to flush, it could be because there is dirt or debris blocking the bypass hole. Watch this video to learn how to clean the diaphragm. Over time, the diaphragm will eventually wear out, and will need to be replaced. Permex diaphragms last up to four times longer than the old rubber diaphragms. Sloan has been installing Permex diaphragms in its Royal flushometers since 1998, when it introduced the dual-filtered bypass assembly. The dual-filtered bypass filters the water twice before it reaches the bypass hole, which greatly reduces the possibility of dirt or debris clogging the hole. Using dual-filtered bypass assemblies will also cut down on the time spent servicing a Sloan Royal flushometer. Dual-filtered bypass assemblies only come installed on Royal Flushometers, not Regal. 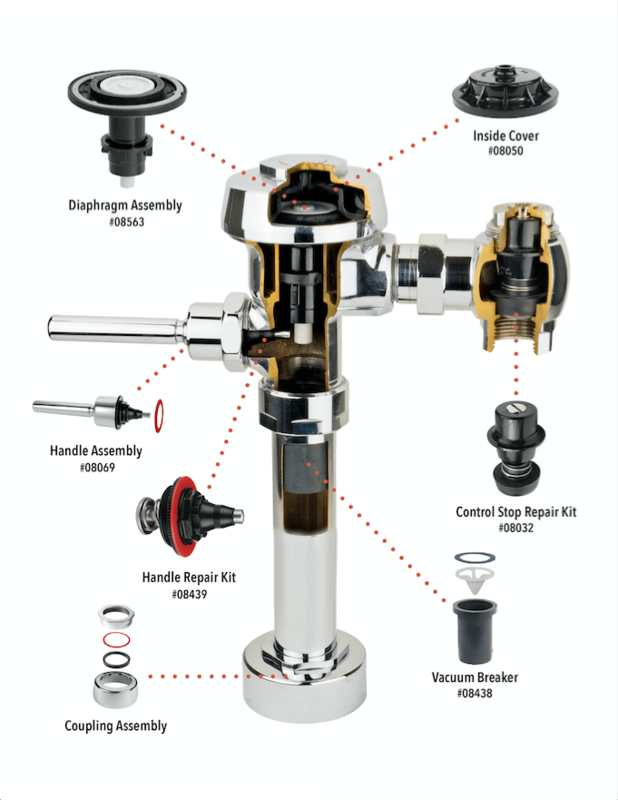 However, when the time comes to replace your diaphragm assembly, dual-filtered bypass replacement kits can be installed in Royal or Regal flushometers. 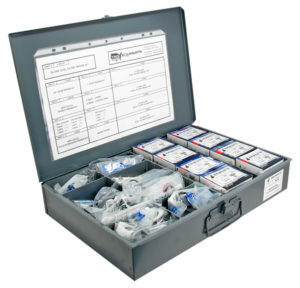 There are many different diaphragm kits available with different GPFs (gallons per flush) for different Sloan Flushometers. Visit our Sloan Manual Parts page to see which one will work for your valve. The hard plastic Inside Cover serves as a barrier between the diaphragm and the outside metal cover, and helps to seal the upper chamber of the valve. If a crack develops in the cover, it breaks the seal and disrupts the pressure, and so it will result in non-stop flushing, or water leaking around the outside cover. Order part #08050 to get your valve back in proper working order. Life expectancy is five to seven years. The Control Stop is where water flows into the valve from the supply line. You can turn the water on and off by removing the stop cap, and turning the stop screw clockwise or counterclockwise until it can’t turn anymore. You can also control the water pressure by turning the screw to a position between full on or full off. If water is splashing out of the fixture, reduce the water pressure by turning the screw clockwise. If there is not enough water flowing to adequately flush the fixture, then turn the screw counterclockwise. There are many types of control stops and stop repair kits available. The Handle Assembly is what initiates a flush. When the handle is pulled, the plunger inside the assembly is pushed into the relief valve, which raises the diaphragm and releases the water from inside the valve. 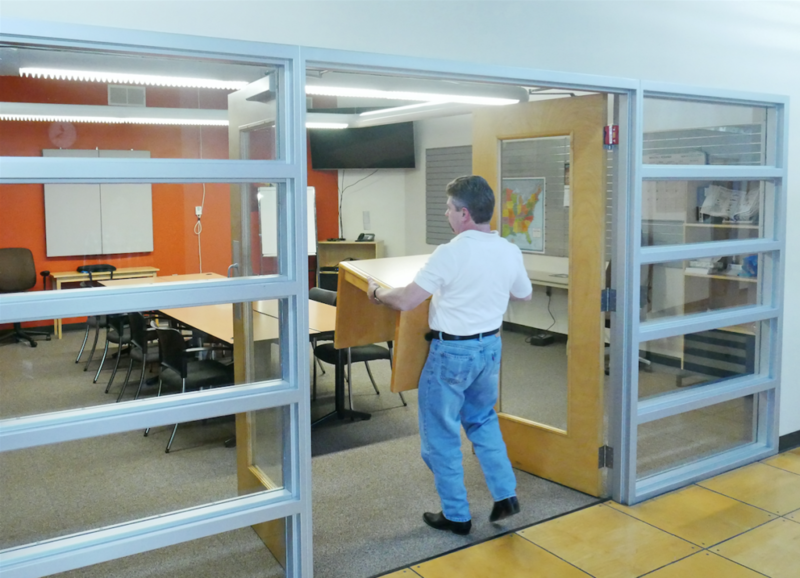 Handle assemblies have a life expectancy of four to six years, depending on usage. If you begin to see leaks around the handle, or if the handle is sagging, you probably need to repair your handle assembly. For Royal, order Sloan Handle Repair Kit #08439, and for Regal, order part #08007. For a complete Sloan Handle Assembly, order part #08069 for Royal, and #08008 for Regal. The job of the Vacuum Breaker is to make sure all of the water is eliminated from the tube during a flush, and prevent water from flowing back up the pipe and contaminating the water supply. During a flush, water flows down through the black rubber part of the vacuum breaker. But if the water were to flow back up the tube, the design of the rubber part closes off and doesn’t allow water to flow through it in the opposite direction of the flush. To prevent water from staying in the tube, there are vent holes at the top that allow air to flow into the tube. This breaks the vacuum and lets all of the water flow out of the tube into the fixture. Over time, the rubber part of the vacuum breaker will deteriorate, and you will notice water leaking out of the tube from the vent holes under the nut. When this happens, it’s time to get a Vacuum Breaker Repair Kit. For Royal, order #08438, and for Regal, order #08012. As you can see, a Sloan Manual Flushometer has many parts that must work together in harmony to keep it functioning properly. While Sloan does manufacture high-quality parts and units, many of those parts are not meant to last forever and will need to be replaced in time. How soon you will need to replace those parts depends on how often the flush valve is used. 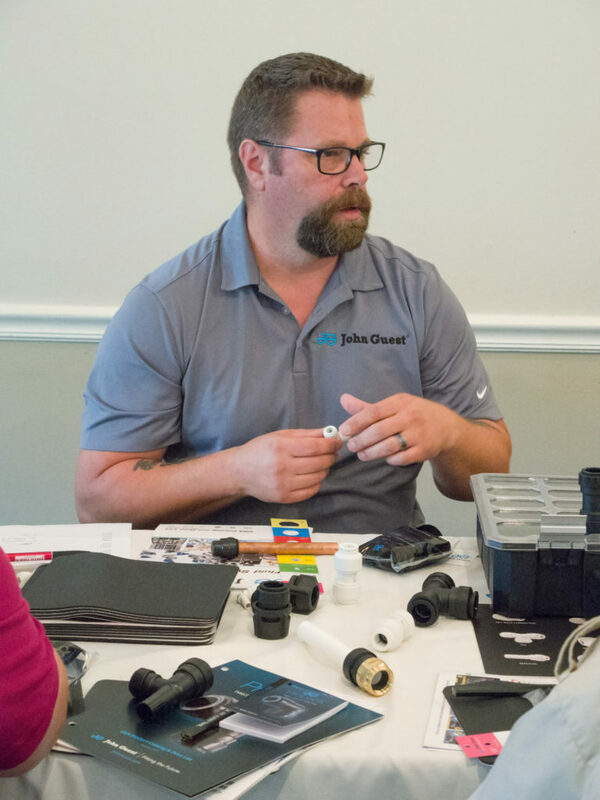 In response to plumbers who like to be prepared for any situation, Equiparts has created two Sloan Master Repair Parts Kits that contain just about anything you would ever need to repair a Sloan manual flushometer. 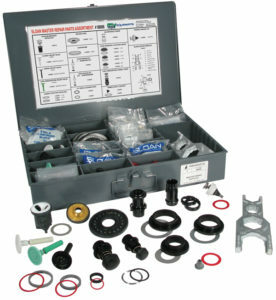 These kits are a great way to be prepared for any situation when you are repairing a Sloan flush valve. They are a must have for any plumber or maintenance man who services a building or facility that utilizes a large number of Sloan flushometers. Our most popular kit is the #08066, A 101 piece kit that contains parts for Regal and older Royal flush valves. We also have kit #08730, a 71 piece kit for newer Sloan Royal flush valves that use the dual-filtered bypass. You can order them by clicking on their part numbers in this article, or as always, you can give us a call at 800-442-6622 if you have any questions. Our technical experts will be happy to help you.